Twenty-one year old Beth is in prison. The thing she did is so bad she doesn’t deserve to ever feel good again. But her counsellor, Erika, won’t give up on her. She asks Beth to make a list of all the good things in her life. So Beth starts to write down her story, from sharing silences with Foster Dad No. 1, to flirting in the Odeon on Orange Wednesdays, to the very first time she sniffed her baby’s head. But at the end of her story, Beth must confront the bad thing. What is the truth hiding behind her crime? And does anyone-even a 100% bad person-deserve a chance to be good? Disclaimer: I received a copy of this book from Penguin UK in exchange for an honest review. This has not changed my views in any way. 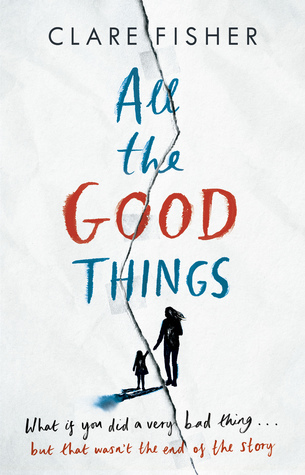 Note: This review will also be published on June 23rd as part of the All the Good Things blog tour. The easiest way I can describe All the Good Things is raw. This is pure, honest feelings. There is absolutely no filter, and I loved it. Beth is the perfect protagonist. She tells her story in a great way – and I loved the use of flashbacks to all the different parts of her life. The cast of characters is large, and I actually enjoyed that. Most of the time I find it easier to focus on just a couple or small group of main characters, but this time, it worked. I knew who everyone was, why they were there and what they added to the story. And that’s the other great thing – all of the characters fitted. All of them worked well together, and they were all needed to complete the story. The story Beth tells is one of the most difficult I have ever read – but at the same time, I couldn’t stop reading. I became very attached to Beth, the damaged soul she is, and I wanted to know she would be okay. The writing is extremely clever, in that we get to know Beth before finding out about this ‘bad thing’. In fact, we know everything about her and her life before this ‘bad thing’, and it works so well. This stopped the judgement surrounding people in prison. It stopped the way we feel towards people who have committed crimes this serious, because we, strangely, were forced to understand. We were forced to relate. The fact that Fisher could do this in words baffles me. I look up to her and respect her as an author, because she did something beyond belief. I love the lead up to the big ending in the story. The book follows a series of sessions Beth has with her counselor, Erika, in which she writes a list of all the good things in her life. With each point on this list, another part is added to the story. So…did I guess the ending? I have to admit, I did. Not completely, but it was like this thing in my head was nudging me, going ‘it could be this, it could be this’, and it was right. But, the same as Beth, I didn’t want to accept the fate. And, the same as Beth, I ignored the nudging. This means the book works whether you guess the ending or not – because you still don’t want to face it, and you still want to find out what really happened. Overall, this book was harrowing, but it needed to be. It was real. It was human. It showed a very important thing – we are complicate creatures. We are all different, and we are not defined by one single thing. A beautifully written debut, and one I would thoroughly recommend to all readers. Haha I was so confused before I realised we have the same name 😛 It’s really good! Haha that’s probably true! It’s surprising how little they come up, though.